Play some map games with your child and help develop life long map reading skills. 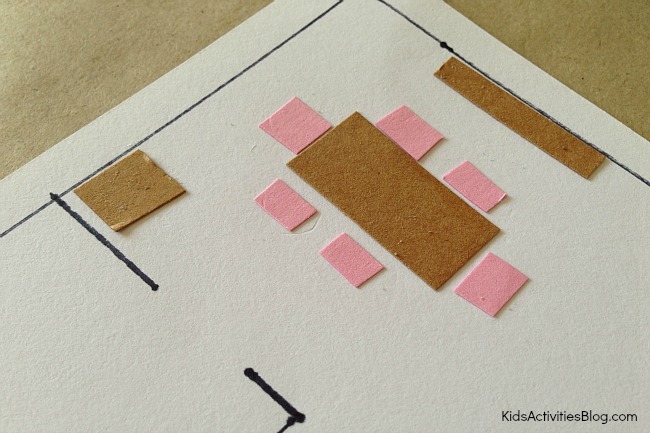 For fun, draw a floor plan and try this simple treasure hunt map activity. Kids Activities Blog hopes your child has lots of fun with this treasure hunt as they learn some basic map skills for kids. 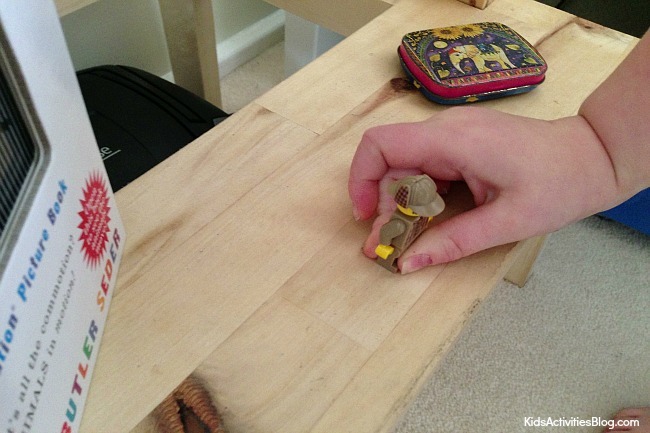 This is a fun twist on the classic treasure hunt game. Instead of simply hiding a few objects and having my son look for them, I drew up a basic floor plan of our home and marked the hiding place of each item on the map. 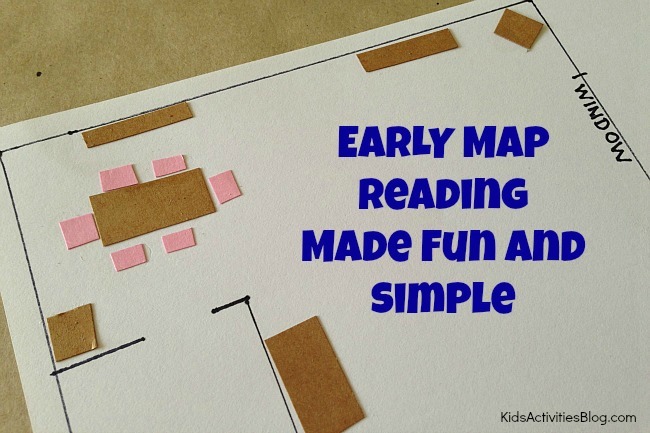 This was a fun and simple way to introduce the idea of map reading to my son and it was a great way to improve his visual literacy. 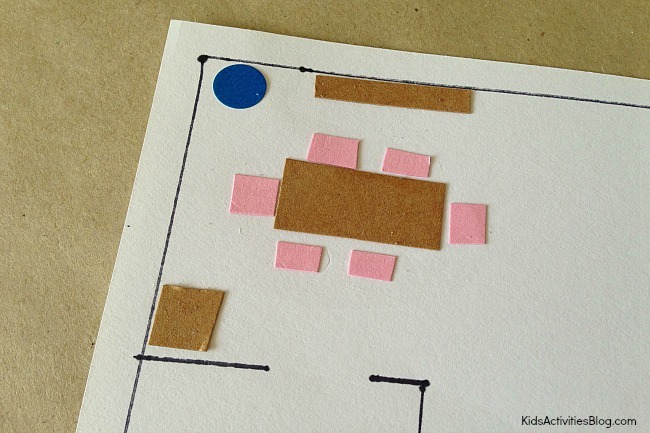 I began by drawing a floor plan of our home on some paper. It was a fairly basic plan and I wasn’t overly concerned with scale. I simply made sure that each room was included and doors and windows were in the correct place on the map. Next, I cut out card stock in basic shapes to represent the furniture in each room. My son and I then discussed where we thought each piece of furniture should be placed on the map, to accurately represent the rooms in our home. We positioned them on the map and once we were happy that they were in the correct place, my son glued them on to the map. The picture above shows our dining room as it was represented on our map. Next, I hid five Lego mini figures in various places around the house. I then placed five blue dot stickers on the map of our home, indicating where I had hidden each Lego figure. I handed the map to my son and explained that we needed to read the map to find the location in our home that was being represented by the blue dots. I helped him with the first one, as he navigated his way around using the furniture on the map as “landmarks” and points of reference. Excited by this first success, he quickly began reading the map on his own and excitedly ran through our home, reading the map to find the remaining figures. This was a really fun activity which we have repeated many times now and each time my son is learning valuable orientation skills. He also loves to hide the Lego figures himself and then I have to find them. This is a great way to switch things up as he then needs to place the blue dots on the map in the place that represents where he hid the figures. Now that he is confident in reading a map of our home, I’m working on extending this activity by creating a basic map of our neighborhood and we’ll search for landmarks as we learn to orientate ourselves with a map on a larger scale. I do enjoy the way you have presented this challenge and it does supply us a lot of fodder for thought. Nonetheless, because of just what I have experienced, I simply trust as the actual commentary pile on that folks stay on issue and not embark on a tirade regarding some other news du jour. Yet, thank you for this exceptional piece and whilst I do not really concur with this in totality, I respect the perspective.